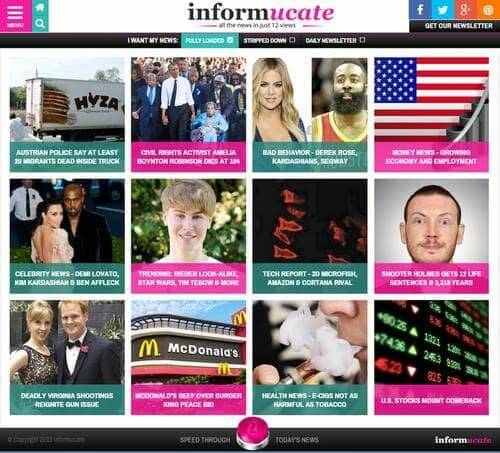 All The News in Just 12 Views at Informucate! How do you update yourself with all the daily news? Do you read all the current events happening around the world? Is it time consuming going through different websites to read about your favorite topics? Most people agree that following the news and current events is important, yet as many as one third of people don’t keep up with the news on a regular basis. Among reasons cited for NOT following the news are the time required, difficulty in understanding the topics, bias of news sites, sensationalism of the headlines, negativity and fear mongering by the media, and the annoyance of click bait and video ads. 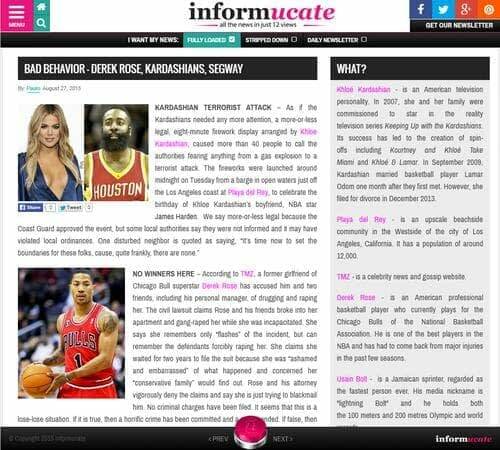 Informucate.com is a different kind of news site that seeks to address these issues by providing All the News in Just 12 Views, leaving out the bias, bloat and bull! Informucate synthesizes the news into just 12 current stories, each only a paragraph or two, with explanations of jargon, concepts, and key terms right alongside the stories. Not sure about ISIL? Don’t know what FOMC means? Can’t remember who Rand Paul is? Don’t understand the terms Triple Crown, Grand Slam, or March Madness? Anytime you read a story with terminology, jargon, abbreviations, institutions, or names and places that might be unfamiliar, there is a quick explanation right alongside the article. Informucate is not a news aggregator. All daily stories are selected by editors and written by journalists. Compared to bloated and biased news sites, as well as other “explainer” sites that in actuality do not explain, informucate allows viewers to get their news in just a few minutes a day, and more importantly, understand what they have read. The 12 stories cover the top news of the day, as well as health, trending, entertainment, money, technology, and the popular ‘bad behavior’ report. By presenting a mixture of news that runs the gamut from serious to entertainment to trending, the 12 stories give everyone the information they need to stay informed and be more confident at work, school and in social settings. Best of all, it takes just 6 minutes a day to get informucated. In addition to news stories, there’s also a fast facts video encyclopedia that includes fun daily trivia and other short videos on subjects including dogs, cats, US Presidents, colleges, holidays, and more.